The nose has crisp bonfire smoke, sultanas and a hint of citrus. The mouthfeel is decent with a little cling. 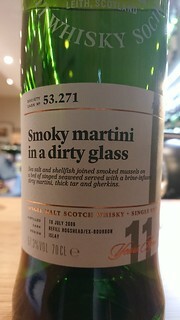 The body has peat, tar, sultanas and crisp bonfire smoke. The finish has crisp bonfire smoke, tar and sultanas. Water brings out thin, rapidly expanding whorling that settles rapidly into brief mottling. The nose gains tar and loses the sultanas and citrus. The body gains peat and more tar, and loses the sultanas. The finish loses the sultanas. A big belter, but far from uninteresting.